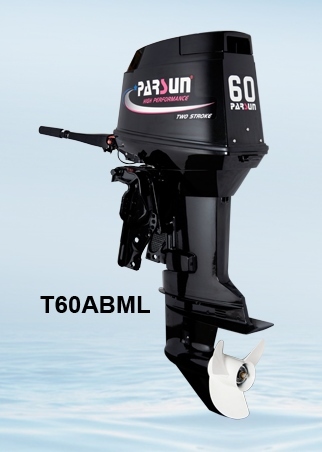 PARSUN T60A outboard is designed and built to withstand the heavy-duty work for long continuous hours all day, and to meet the most demanding boaters who use the outboard motor on fishing and passenger boats. 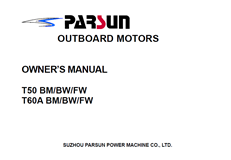 The enhanced strength of roller bearings, crankshaft, piston & piston ring and crankcase, together with a better water cooling system, combines to make PARSUN T60A outboard highly durable and reliable. 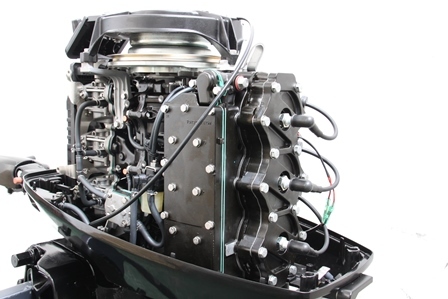 Having passed the rigid trial tests, PARSUN T60A outboard motor offers unbeatable value for money, outstanding power and fuel economy, and great performance. 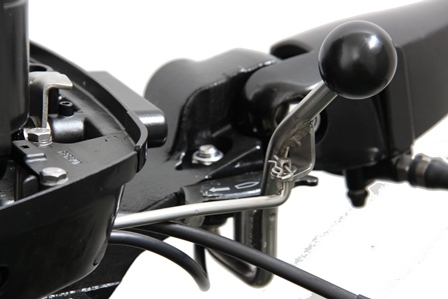 1.The outboard can be set at a tilt angle, preventing it from hitting the bottom when operating in shallow water. 2.Start in gear protection for increased safety. 3.Equipped with the overheat warning & over-rev limiter to avoid the unexpected failure. 4.Extremely durable crankshaft, long life piston/piston ring, sturdy gears and gear case to get the excellent reliability. 5.Drain plug magnetized to collect any metallic particles in the gear oil to keep them from causing damage to the gears. 6.Three cylinders design which stands the endurance test and is proven to be powerful, efficient and reliable. 7.Hydraulic elevator or power trim & tilt device for operation easily. 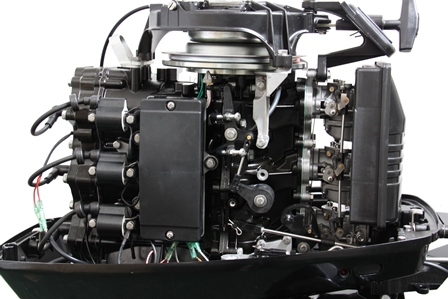 8.CDI ignition system to provide automatic spark and maximum power for engine. 9.Loop charging fuel intake delivers great fuel economy, and smooth and responsive acceleration. 10.Thermostat controlled water cooling system. 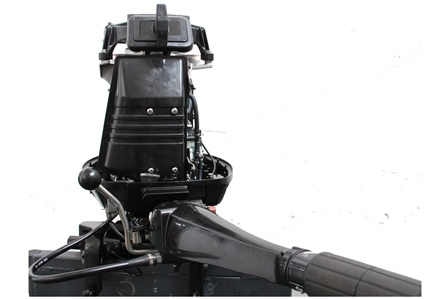 11.Vibration reduction system for smooth performance. 12.Include 24L portable fuel tank with fuel hose, remote control, basic instruments and tool kits. Safety:Engine safety stop lanyard with emergency shut off switch for stopping the engine immediately. Quiet: Through propeller hub exhaust offers lower noise and exhaust. 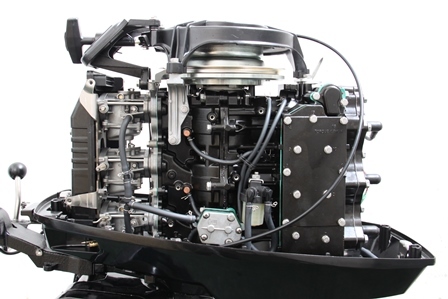 Low fuel usage: The loop charged fuel induction system delivers greater combustion efficiency for higher power and optimum engine performance with less fuel usage. 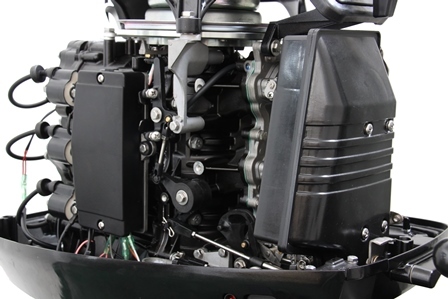 Ultimate corrosion protection: The multiply-layer paint process and high grade marine aluminum alloy protect the outboard motor against corrosion and ensures long term durability. Reliable electric starter: To get a quick and easy start every time. Lighting coil: 12V DC output allows you to run a spotlight. 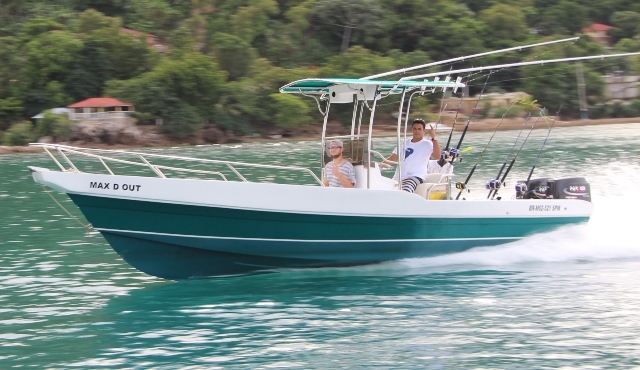 SOLAS propeller: Better acceleration, high top-end speed and smooth handling. 3-13.25 x 15" (standard) or 3-13.6 x 13"